Digitial elevation data from the SRTM is packaged by the U.S. Geological Survey as GOTOPO30 data. The pruneDEM() function is used to ingest GOTOPO30 data into R given a path and file name. The function then extracts data using a boundary box defined by min/max coordinates. The result is a SpatialGridDataFrame. that can be used as a land surface definition for GIS mapping, engineering design, or spatial weather modeling. The following example ingests a large tile of digital elevation data, which can be downloaded below. pruneDEM() will ingest the raster file and extract data given a boundary box. Function output is then plotted with custom colors and axes legends. M0title <- "Digital Elevation Map"
M1title <- "Shuttle Radar Topography Mission"
S0title <- "Fig. 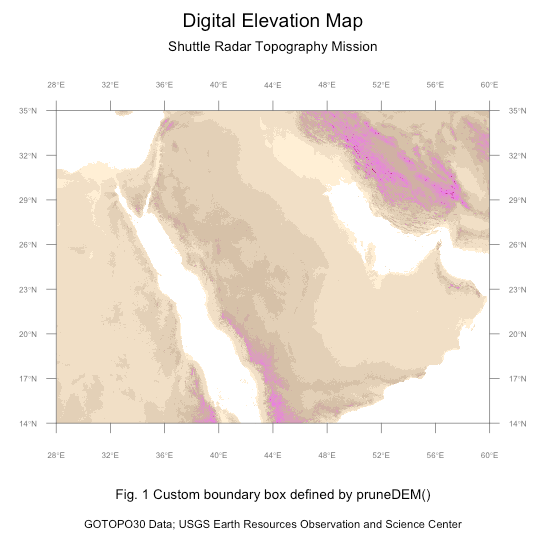 1 Custom boundary box defined by pruneDEM()"
S1title <- "GOTOPO30 Data; USGS Earth Resources Observation and Science Center"
This entry was posted in GDAL, R Data Import, R Graphics, Spatial Analysis. Bookmark the permalink.